Monitor Windows Event Logs, as well as syslog and SNMP trap data, from your infrastructure in near real time. Easily apply color-coded tags to your log data to aid with filtering, searching, and identifying performance issues. Quickly identify if a Windows event contributed to a system outage or performance slowdown. Your infrastructure continuously generates log data to help provide performance insight, and monitoring logs in real time can give you the immediate insight you need. Whether it’s syslog, SNMP traps, or Windows Event Logs, these critical pieces of insight can help with troubleshooting—but without an efficient and easy way to consume this data, you may not be fully leveraging these insights. Monitor, collect, consolidate, and analyze Windows Event Log information using a single tool that can help you find the root cause faster. SolarWinds® Log Analyzer is the event log monitoring software built to keep your network and business up and running. Event log monitoring tools that offer the capability to search Windows events can effectively provide some of the most optimal benefits to their users in terms of saving time and eliminating additional work. Log Analyzer not only lets you search these logs, but was also built to provide intuitive, out-of-the-box filters, so you can more easily refine your monitored log data to help pinpoint issues. 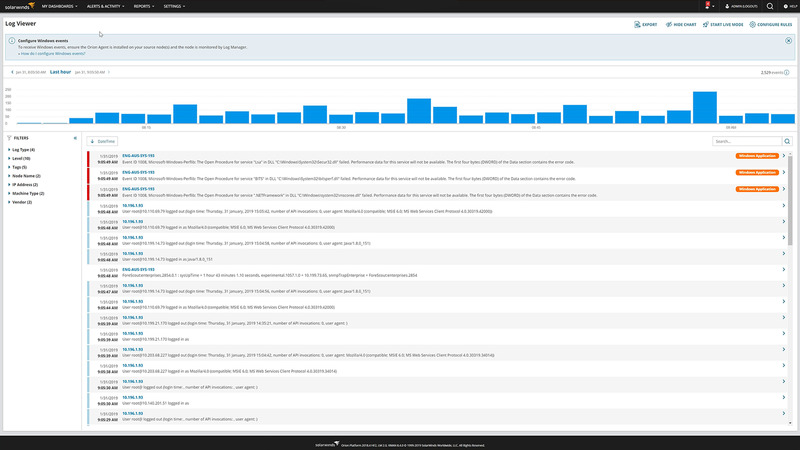 Using the powerful search engine that comes built into Log Analyzer, you can quickly find Windows Event Log entries of interest, which can save you time and loads of work hours. When the blue screen of death is staring back at you, the first question that comes to mind is, “What happened?” With Log Analyzer’s integration with the Orion® Platform, users gain the ability to correlate health and performance metrics on a common timeline with Windows events data. Gain insight into the performance of devices in your environment. See log data in real time with an interactive chart and graph. Rapidly identify performance and availability issues. Not monitoring your Windows Event Logs can mean reduced network visibility and possible missed troubleshooting opportunities, which can lead to a slow network. Inability to identify root cause within your Windows Event Logs can result in a prolonged mean-time-to-resolution. Spending hours digging through multiple tools for event log and performance data may cause lost insights and wasted time.